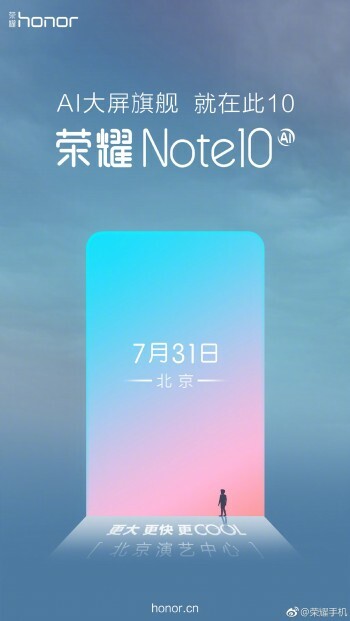 Honor just announced on its Weibo account that the Note 10 will be unveiled in Beijing on July 31. The event will be exclusively for the Chinese market, with the global event taking place in Berlin on August 30, as we already told you yesterday. The post says to prepare for an AI flagship with big screen that will arrive in just 10 days. Size-wise the display is rumored to be AMOLED panel by Samsung with a 6.9” diagonal. According to a leaked photo from earlier this week, the Honor Note 10 is expected to have tiny bezels on top and bottom and even tinier on the sides. The phone also popped up on Geekbench with Kirin 970 chipset by HiSilicon, coupled with 6 GB RAM. The OS is Android 8.1, likely with the latest EMUI version on board. Since the phone is going to be a massive slate, we expect it to have a huge battery supporting Super Charge.